I like bunnies. Who doesn’t? I featured a bunny sewing project before on the ‘boards and am doing it again. A simple felt purple buddy this time to match my daring bold purple table setting. 2 colours felt (I used a dark and middle-tone purple). You don’t need much. 1/4 yard minimum if you buy from a roll or if you buy the pre-cut squares you need 2 for the main body colour and 1 square for the bottom of the bunny. tiny piece of a fun, patterned fabric that goes with your felt colour selection. Select felt colour of your choice. I liked the tone-on-tone purples for my bunny with the contrasting ears but you can go any way you want. Follow the instructions on the pattern and cut one bottom from the darker felt and from the lighter felt 2 bunny sides and 2 bunny ears. Also, cut 2 more ears from the other patterned fabric. 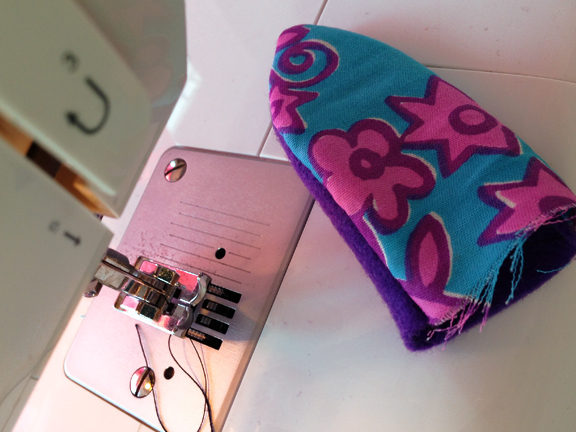 Follow the instructions on the pattern and stitch the bunny together by hand using the blanket stitch. If the below photos do not help and you have never done this stitch before, here is a good tutorial with very detailed steps. Make sure to leave about one inch of your bunny open at the back for stuffing later on. ← 5 DIY Spring wreaths that we love!